Desta vez, o herói Mario deve lutar contra todos os inimigos do Reino dos Cogumelos para salvar Daisy, a princesa. The real star of Nintendo, Mario of Mario Bros, makes his appearance on the Game Boy in Super Mario land, a perfect, crazy romp across many strange worlds. It's a totally new adventure, though gameplay is based on the successful format of the past three Mario platform classics. All the favourite enemies are there with some new arrivals - the turtles now explode, there's flying fish and heaps more. Addiction is the name of the game because not only is each level wonderfully designed and vary playable but there are loads of secret passages and routes to discover. Packed with varied graphics and many different tunes, Super Mario Land does the Game Boy proud. A small yet perfectly formed Mario whizzes past equally impressive sprites and backdrops. An arcade machine in your pocket. Concluyendo, Super Mario Land es uno de esos juegos que están en el recuerdo de millones de jugadores por méritos propios, si bien no llega a considerarse una Obra Maestra por diversos factores, especialmente su escasísima duración, y una nula utilización del sistema donde trabaja, así como algunos fallitos puntuales, sí que alcanza el sobresaliente. No es el mejor de su subsaga, pero sí un título altamente recomendable para amantes de las plataformas o fans del fontanero. Mario, c'est l'emblème d'une génération, l'emblème de Nintendo, et l'emblème des plombiers moustachus. Je crois qu'avec ça, on a de quoi dire que c'est une bombe! On se prend tout de suite au jeu et une fois de plus, on sera séduit par la souplesse et la précision des commandes. Indispensable. Playability to the nth degree! This game is guaranteed a semi-permanent place in my Game Boy, along with Tetris of course. They don’t come much better than this, with great graphics and a tough challenge. Serienheld Mario hat den Sprung vom NES („Super Mario Bros“) auf den Game Boy glänzend überstanden. Das grandiose Geschicklichkeitsspiel wartet mit jeder Menge versteckter Extras und Geheimgängen sowie neuen Spielelementen auf. Wie schon die anderen Super Mario-Spiele ist auch die Game Boy-Version genial. Mario´s first adventure on the Game Boy takes him to a strange world named Sahara where he must rescue Princess Daisy (the Princess of Sahara Land) from the vicious space monster named Tatanga. This game is much like SMB 1 with as simple gameplay and graphics, but here Mario gets the chance to control both a airplane and a submarine. Although Super Mario Land is just a little bit too easy (i completed it on my 5:th or 6:th try!) it´s still a great game who should be owned by all serious Game Boy owners. Take the most successful game of all time, tone down the colours a bit, add a few new meanies and what've you got? One of the best Game Boy titles so far, that's what. Il gioco ha ricevuto buonissimi pareri dalla critica, ma non sempre dal pubblico. Questo perché non è stato sviluppato dal Papà stesso di Mario, ma dal Papà del GameBoy, Gunpey Yokoi. Nel gioco, infatti, noterete che mancano i principali personaggi della serie, i nemici sono diversi e molte ambientazioni differiscono dalle tradizionali. Ciononostante credo sia un gioco da avere assolutamente poiché contiene in sè tutto il fascino di un gioco di Mario, la perfezione di un gioco Nintendo e, soprattutto, tanto divertimento. Jeder GameBoy-Besitzer sollte diesen Titel zumindest einmal angespielt haben! Das zeitlos gute Level-Design und das simple, aber spaßige Spielprinzip überzeugen noch heute. Darüber können auch das merkwürdige Speichersystem und die für heutige Maßstäbe lächerliche Technik nicht hinwegtäuschen. Super Mario Land, as it turns out, is a pretty solid little game. Big surprise, I’m sure, but I was happy that I didn’t feel a need to judge it on a “well, it WAS a Game Boy game, so…” sliding scale and could just enjoy it for what it was. Yes, the Super Mario Land would go in its own direction later in the series, and this iteration definitely feels more like a scaled-down port of Super Mario Bros. more than a completely different game, but hey, there’s no reason to spit in the face of a formula that we know works, and there’s enough quirks here that it doesn’t entirely feel like recycled content. It’s pretty obvious that a Mario game would be one of the first titles out the door for a nascent Nintendo system, and this is definitely a solid one to start off with. I’d recommend it for anyone looking for another tasty scoop of the Mario recipe we’ve come to know and love, especially one that strays a bit from the established canon in terms of enemy design and setting. Schon der erste Teil auf dem Game Boy schlug bei seiner Veröffentlichung wie eine Bombe ein – und das zu Recht. So viel herumtragbaren Spielspaß gab es vorher noch nie. Nach heutigen Maßstäben muß man aber bei aller Liebe zugeben, daß der Zahn der Zeit doch schon etwas an dem Spiel genagt hat. Gerade mit dem Umfang (nur 12 Level) hapert es ein wenig. Erwartet Ihr ein komplexes Riesenspiel in der Art wie Super Mario Bros. 3 oder Super Mario World, seid Ihr mit dem zweiten oder dritte Teil der Serie auf jeden Fall besser bedient, da sie wesentlich mehr Level und mehr spielerische Abwechslung bieten. Echte Mario-Maniacs aber müssen sowieso alle Mario-Abenteuer besitzen. 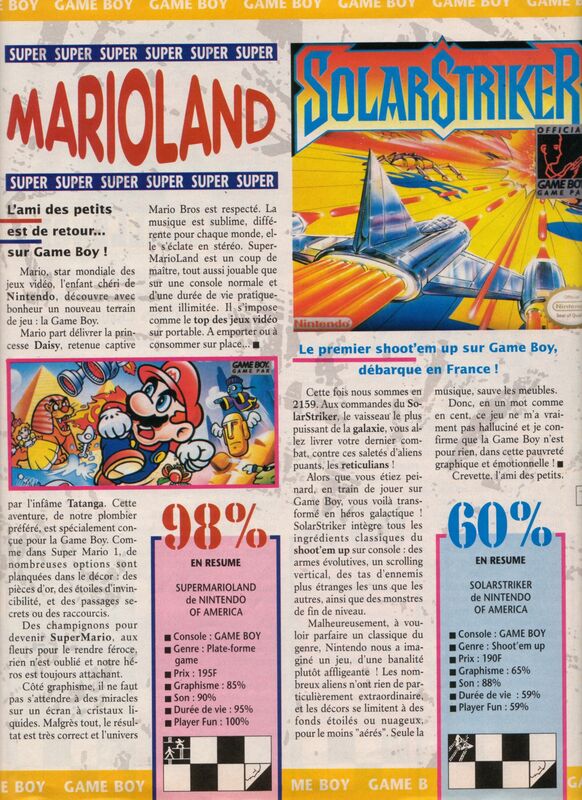 There's no denying that Super Mario Land was impressive when it was first released for the Game Boy system, but given how the length and overall quality of Game Boy releases would increase shortly thereafter, it only made this original seem even more inadequate by comparison. It's still a very fun Super Mario experience, but just about the time things are really getting good, the experience ends and the credits roll. If you haven't played Super Mario Land before, you owe it to yourself to at least give the game a try. The quest might be fairly short, but it's still worth playing through at least once, if only to see where Mario's portable adventures began. Even though its B&W and on a 2 inch screen, Super Mario Land is a fantastic game that is, above all, very fun to play. There are loads of things to discover and all new worlds to chart. It's a bit short (only 12 screens), but there's enough challenge here to highly recommend this one. Super Mario Land is a bit weird compared to Mario’s typical platforming adventures, but it’s a smartly done adjustment to the Game Boy system. Mario’s jumps still get the job done and the levels are spaced well to challenge it smartly, enemies and deadly drops distributed properly to challenge a player on a satisfying yet simple level. Flying and underwater sections add some variety to what is otherwise a solid platformer, their design making sure things still stay interesting even as you’re given better tools to take on enemies and the environment. The game is pretty simple and short on the whole, but it is what it set out to be: an enjoyable yet condensed Mario platforming adventure for a portable system. Despite its short duration Super Mario Land is still lots of fun to play. Each world feels unique and the music and enemies perfectly capture the mood of the environments. It's so different to the usual Mario platformers yet somehow it works. It's too brief an adventure but it has a simplistic charm that's undeniably Nintendo. For those of you who have already played this game and are reading this review, you’ll already know what I mean about the controls. That’ll set some people off right away, but once you get used to it, this game is addictive. You’ll try and try again to be it, so good luck. Ultimately Super Mario Land is an adequate platformer with some fun themes and novelty levels, but nothing that stands head and shoulders above its contemporaries. It's a fun deviation from the classic series yet unfortunately one that fails to capture the magic of more heralded romps in the Mushroom Kingdom; the bizarreness is worth the experience, but not something you'll have to come back to. Ultimately, although it's a decent, basic platforming experience, it's just not what I as a Mario fan would have been seeking in a portable edition of the world's favourite Italian plumber. What designer Gunpei Yokoi, named also as the creator of the Game Boy, had likely tried to make was a miniature version of Super Mario Bros. for the NES, and, well, he just forgot to play the NES game prior to developing this title. Super Mario Land was made by a different team than the usual Mario games and it shows. I can only imagine the game we would have received if Mario's usual leader, Shigeru Miyamoto, was on the case! I could recommend this game only under the condition that you don't take it too seriously as a Mario game. Just accept it as an average platformer at best.